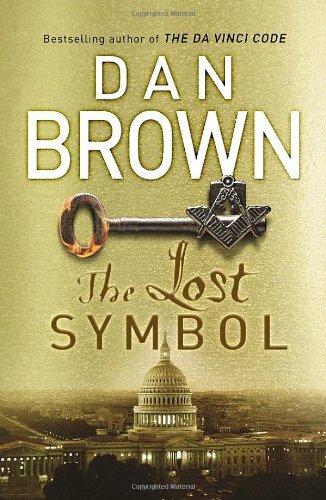 The Lost Symbol by Dan Brown is a thrilling masterpiece that takes you into the world of secrets societies, ancient mysteries, symbols, conspiracies and unseen truth. Read on to know about my thoughts on the book. 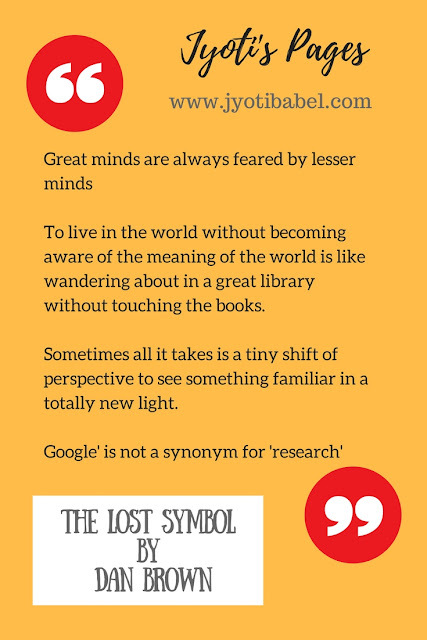 I just finished reading 'The Lost Symbol' by Dan Brown. I borrowed it from the local library and it was sitting on my bookshelf for quite a time. I do not know why but somehow I was not really in a mood to read any novel. But, because of the bad weather these days, I was staying indoors most of the time. So, finally, I started to read it a week back and its over now. I found the first half of the book more entertaining than the end half. Somehow, I was a bit disappointed with the way it ended. Those who have already read Brown's Angels & Demons and The Da Vinci Code will find that the story is set in the same fashion as in these books. So, it seems a bit monotonous at times. The whole story is set in Washington D.C where Robert Langdon comes on an invitation from his mentor to deliver a lecture in the Capitol Building. The story in the novel revolves around Freemasonry and its secrets that are imbibed in the architecture of the city has a couple of prominent characters namely Langdon, Peter Solomon, Katherine Solomon-Peter's Sister, Malakh - the villain in the story, CIA director Sato, Warren Bellamy-the architect of the Capitol Building, a Mason and Peter's trusted friend. The story moves very fast paced and there are surprises at short intervals. Soon after Langdon has arrived at the Capitol Building, he discovers that he has been tricked into coming to D.C. He receives a call from Malakh who tells him that it was all his idea and that Peter is his captive at the moment. He tells him to do what he wants or else Peter's life is at stake. The night takes another bizarre turn when a hand gruesomely encoded with five symbols appears in the Capitol building and Langdon recognises it to be of Peter. The encoded hand symbolises an invitation meant to usher its recipient into the world of long-lost ancient esoteric wisdom. Langdon realises that his only hope of saving his friend's life is to accept the invitation and follow it where ever it leads him. Director of CIA, Sato takes control of the scene and urges that there is a matter of national security threat in which she needs Langdon's co-operation. Langdon is apprehensive about Sato's motives but still, he follows her instruction and decodes the mysterious hand and lands up in a place to find an ancient masonic masterpiece which can unveil enormous power to the worthy. At this point, Warren Bellamy who wants to guard the ancient secret saves Langdon from Sato's hand. Langdon saves Katherine Solomon who is a neotic scientist from the clutches of Malakh and she joins Langdon in unveiling the ancient secret which she believes is the only way she can save her brother. The story then takes several twists and turns before the final revelation of the ancient secret, which does not seem to be a very surprising secret. The last half of the book is filled with too much of technical details of symbolism that it seems difficult to engulf at one moment. The mystery loses its charm somewhere and hence it is somewhat disappointing at the end. What I would say if you are planning a visit to Washington D.C then surely read it and take a copy of it with you. The visit will be more enlightening. Surely enough, after reading the book I did give a good look at the one Dollar bill & The American Seal and in future, if I read about George Washington, I will study a bit deeper. You might want to know the reason, then surely you have to do the same thing as I did. Go and grab a copy of the book from the library or if you a die-hard fan of Brown, buy yourself a copy. You might also want to check out the other Dan Brown books that I have read and reviewed here. I remember reading Davinci code.. it was utterly riveting.. Nice review.. I have to buy the book or download ebook to read.. not many local libraries around..